Research firm iSuppli reports sales of hard disk drives totaled $9.6 billion in the first quarter of the year, a new record thanks to higher average selling prices since the Thai floods severely disrupted the HDD production chain. The record revenue occurs even though shipments fell from 174 million units in Q3 2011 to 145 million units in Q1 2012. iSuppli believes it will take until Q3 2012 before HDD production will recover to pre-flood shipment levels. The global hard disk drive (HDD) industry surged to record revenue in the first quarter, thanks to higher average selling prices that compensated for the wreckage and loss in shipments left by the October floods in Thailand, according to an IHS iSuppli Storage Market Brief report from information and analytics provider IHS (NYSE: IHS). HDD revenue for the first quarter reached $9.6 billion, an industry high that bested the previous record of $9.3 billion in the first quarter of 2010. The rise in HDD revenue occurred even though shipments during the first quarter of 145 million units were less than the 174 million units of the third quarter last year, just before destructive floods in October damaged a wide swath of HDD factories located in Thailand. A full recovery to pre-flood shipment levels is not expected until the third quarter, one full year after the disaster. “Revenue in the first quarter was up because of a rise in HDD average selling prices to approximately $66.28, compared to $51.49 in the third quarter before the flooding,” said Fang Zhang, storage analyst at IHS. “The ASP will not return to pre-flood levels in the short term and will stay at elevated levels throughout 2012 and 2013, helping the HDD industry make up for some of the losses following the disaster. 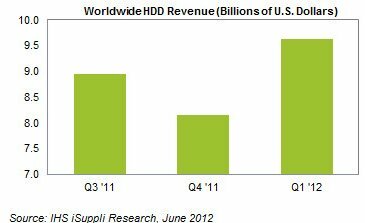 The figure below shows HDD revenue from the third quarter last year before the flood, to the first quarter this year. Revenue was higher in the first quarter, even though shipments during the same period were well below those in the third quarter before the flood. And like revenue, ASPs climbed to higher levels in the first quarter compared to pre-flood levels. Among HDD manufacturers, Seagate Technology had the largest share of revenue at 46 percent, followed by Western Digital Corp. at 32 percent, Hitachi Global Storage Technology at 11 percent and Toshiba Corp. also at 11 percent. Hitachi GST was acquired by Western Digital toward the end of the first quarter in March, and these shares for both Western Digital and Hitachi GST represent revenue recognized during the quarter, the period prior to the merger. No. 1 Seagate’s first-quarter revenue of $4.45 billion includes all shipments from the recently acquired hard disk business of Samsung. The market leader in HDD revenue for the past decade, Seagate has also held down the top spot in HDD shipments for the last two quarters, after archrival Western Digital sustained heavy damage in Thailand and lost its pinnacle position. Seagate is likely to maintain its perch at the apex in both revenue and shipments for at least another quarter, IHS predicts. Seagate’s HDD shipments, including Samsung’s output, amounted to some 60.7 million units in the first quarter. For Western Digital, the revenue picture brightens if it includes $614 million from Hitachi GST’s three-and-a-half-week revenue after the merger between the two was completed in March. Without Hitachi GST’s portion, Western Digital’s first-quarter revenue would be slightly below its third-quarter, pre-flood level of $2.6 billion. Going forward, Western Digital expects revenue to hover between $4.2 billion and $4.5 billion, including full contribution from Hitachi GST. Western Digital’s HDD shipments during first quarter amounted to 44.2 million units, including the Hitachi portion at the time of the merger. Toshiba’s first-quarter revenue of $1.1 billion was, like Western Digital’s, below its pre-flood revenue of $1.3 billion in the third quarter. Just recently, Toshiba announced it had completed the exchange of its Thailand manufacturing plant in Pathumani with Western Digital’s facility in Prachinburi. Toshiba also has consolidated its HDD production operations in the Philippines and China, reducing scale in each country in order to lower manufacturing costs and improve efficiency. Toshiba, which aims to double its HDD sales to approximately $10.0 billion by 2014, shipped a total of 20.6 million HDD units in the first quarter. Also contributing to a healthier revenue picture for the HDD industry was a rise in gross margins and operating margins. The higher numbers here were positive indicators of the companies’ ability to pay down their fixed costs and were, therefore, reliable barometers of good financial risk. Seagate enjoyed a gross margin of 37 percent in the first quarter—a company record mainly due to higher ASPs—and also saw its operating margin reach 27 percent, up from 19 percent in the fourth quarter. For its part, Western Digital saw gross margin climb to 32 percent, and its operating margin also rose to 18 percent, up from 8 percent in the fourth quarter of 2011. Both players expect their gross margins to remain higher in the second quarter, to about 35 percent.